We had our blow-em-up day, now the French will have theirs. True, our independence wasn't based on cutting the heads off nobles, but it should have been. I usually forget Bastille Day and I think, merde, I forgot Bastille Day again. This year, I remembered it and baked a beautiful quiche pour un. 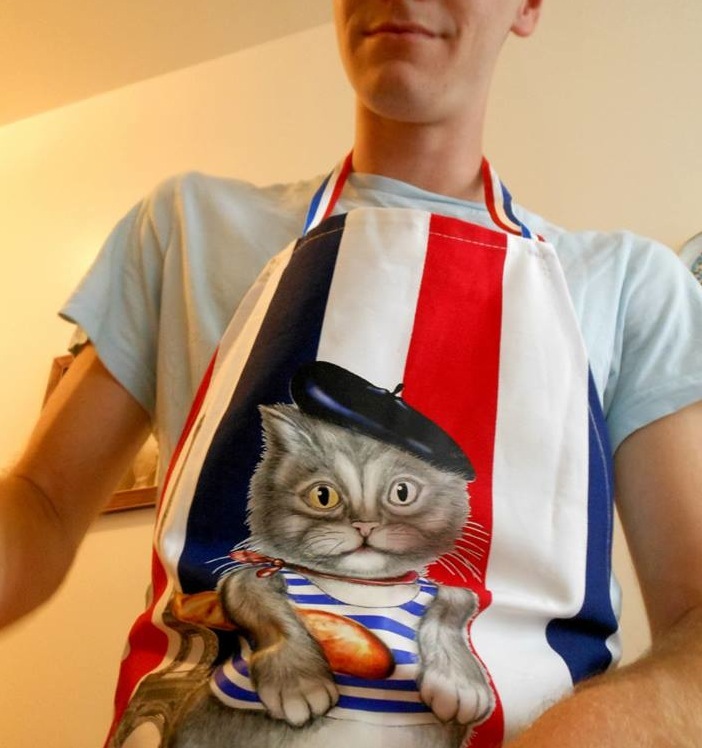 If the apron doesn't say Francophile or spinster, I don't know what does. It comes courtesy of a friend of mine who visited Paris last fall. I remember really wanting it when I was in Paris, but too ashamed to buy it for myself. Step 1: Make a savory pie crust by combining dry ingredients and cold butter cut into coarse crumbs. Add 3-4 tablespoons ice water and roll out. Chill dough while making filling. *Add some shredded cheese to the crust if you want. Step 3: Preheat oven to 425. Grate cheese, slice onions, cook and crumble bacon, set aside. Whisk together milk, eggs and seasonings in a mixing bowl. Press pastry into dish and bake ten minutes. Step 4: Reduce oven to 325. Layer lightly browned pastry with bacon, onion, cheese and thyme. Pour egg mix over and bake one hour or until solid. Allow to cool completely before serving. *I used a pie bird to keep the filling from bubbling over.